Steel Rubber Perforated Plates - Sovatec Industriale S.r.l.Steel Rubber Perforated Plates - Sovatec Industriale S.r.l. 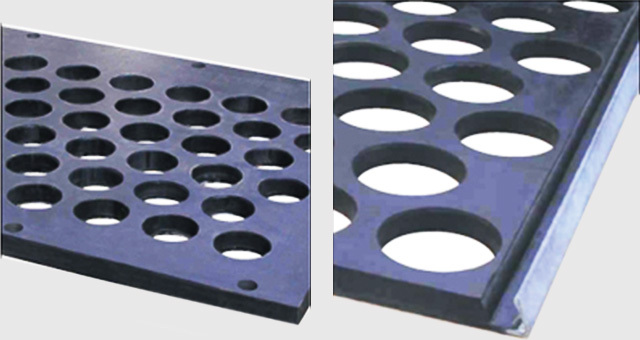 The steel rubber perforated plates are made by steel plates covered by a layer of abrasion proof rubber. The thickness of the steel plate varies from 2 to 20 mm, the rubber from 10 to 55 mm. Special adjustments in perforating make the hole in the rubber slightly smaller than the hole in the steel plate, so avoiding the risk of clogging. The operating life of steel rubber perforated plates is usually many times longer than that of the perforated plates.